Le Club Accorhotels has launched new triple & quadruple Airberlin Topbonus miles offer for stays August 17 – December 31, 2015. 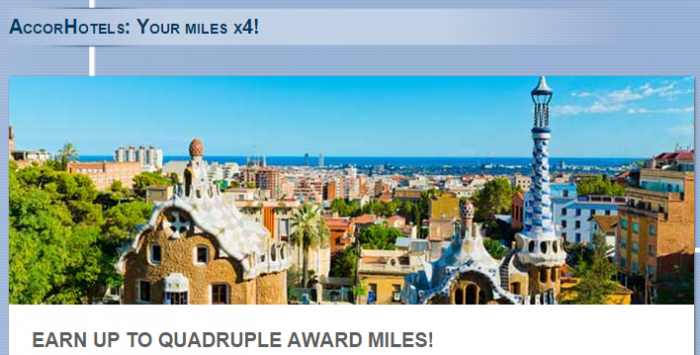 You can earn triple miles for stays August 17 – September 30, 2015, and quadruple miles from October 1 to December 31, 2015. The offer is valid for reservations done on/after August 17. Note that you can take advantage of this promotion maximum of FOUR times during the offer period. Triple/quadruple miles offer can make sense for some, but I personally rather take advantage of the bonus points offers that Le Club Accorhotels offers OR when there is a promotion for a fixed number of airline miles. • The offer “triple award miles” is valid for a stay from 17/08/2015 – 30/09/2015 in one of the participating hotels worldwide, and booked between 17/08/2015 – 30/09/2015. • The offer “quadruple award miles” is valid for a stay from 01/10/2015 – 31/12/2015 in one of the participating hotels worldwide, and booked between 17/08/2015 – 31/12/2015. • To earn miles directly after each stay in the participating hotels of the Accor group, you need to register online (DE: http://www.accorhotels.com/de/leclub/topbonus / EN: http://www.accorhotels.com/gb/leclub/topbonus) or enroll at a participating hotel. • topbonus participants that are already Le Club Accorhotels members and want to earn bonus points after each stay, need to select topbonus as their preferred reward option in their member account and activate the direct earn function here: (DE: http://www.accorhotels.com/de/leclub/topbonus EN: http://www.accorhotels.com/gb/leclub/topbonus). • A stay is defined as one or more consecutive nights at the same hotel. • Each topbonus member can benefit from this offer maximum 4 times. • Points will be credited to your mileage account automatically 2 weeks after your stay. • The amount of bonus points will be calculated based on Classic status. • The terms and conditions of Le Club AccorHotels apply. • To benefit from this offer, the booking must be made on AccorHotels.com or participating brands web sites, via the AccorHotels-App or via Accor call centers. All other reservation channels will not be eligible to this offer.